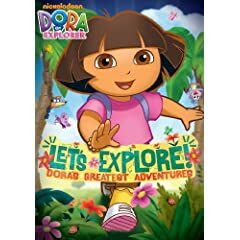 With Over 3 hours of entertainment this is the DVD to get for your Dora Loving kids. Dora The Explorer: Let’s Explore! Dora’s Greatest Adventures will be released on February 2, 2010 full of Dora. There are 8 different episodes and each is filled with a different lesson. In one episode Dora and Boots must create a map of their own to save their friend the map. Dora has been teaching my son a few words. He can say, Dora, Boots, Backpack, purple backpack, map. When it’s time to use the map, he says map, louder and louder. The Map, The Map. I would probably still not like Dora if it wasn’t for her educational value, and the fact that my kids want to watch her all the time. I just can’t hate her. My daughter has decided to call this one Yellow Dora, I think it’s because the packaging has quite a bit of yellow on it. I was sure that she would be calling it Purple Dora, because the third Episode is Journey to the Purple Planet. Dora teaches Spanish, colors, shapes and counting. Zoe can count all the way up to 14 and can say her entire alphabet. I’m not saying Dora is responsible, I did a little work. Lost Map: When a goofy bird mistakes Map for a stick and puts him in a nest, Dora and Boots need help to draw their own map and rescue their good friend. I liked that in this episode Dora and Boots made the map. Hide and Go Seek: To win Senor Tucan’s trophy, Dora will need your help finding her friends in the Spooky Cave, the Squirrel Trees, and the Rainforest! I liked Senor Tucan most in this episode. Journey to the Purple Planet: Blast into space with Dora and Boots to bring five lost space creatures back home to the Purple Planet! I liked the little aliens, and their cute little names even though I can’t think of them right now. Rescue, Rescue, Rescue: Baby Jaguar is stuck in a tree! Isa is stuck in a hole! And Benny is stuck atop a geyser! Will you help Dora and Boots race to everyone’s rescue? I liked watching them decide who to save first, how does a person make a choice like that? Star Catcher: Abuela gives Dora a Star Pocket making her a Star Catcher! But when Swiper swipes it, Dora needs help from you and the Explorer Stars! I liked my kids learning about shapes in this one. Star Mountain: Oh, No! Swiper swiped Dora’s necklace and threw it to the top of Star Mountain! To get it back, Dora needs your help, and the help of some Explorer Stars too! I liked that there were also shapes in this one too. Boots To The Rescue: Dora wrote a song for music classs, but she left it in Boot’s room! Will you help him on his big solo adventure to school? I liked the song about speaking Spanish in this one. It’s very catchy. Swiper the Explorer: To help a lost baby fox get back to his Fox Hole, Dora and Boots get help from an unlikely hero….Swiper. I liked that Swiper wanted to be helpful. Yes this DVD was sent to me by Nickelodeon for purposes of this review. The link above is an affiliate link, I think I’m required to tell you that.